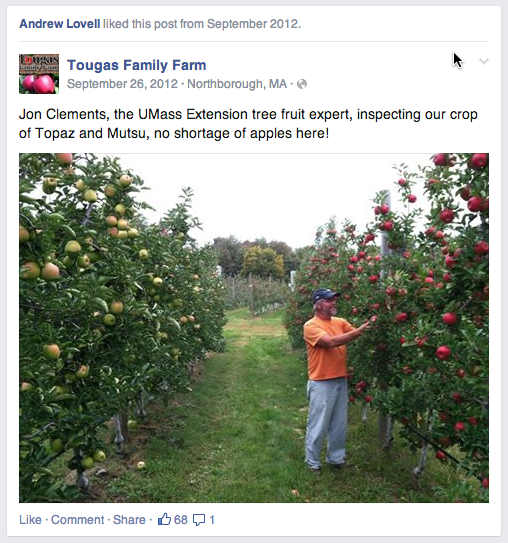 14-May, 2014 Fruit Twilight Meeting at Dowse Orchard, 98 North Main St., Sherborn, MA (www.dowseorchards.com) 5:30 to 7:30 PM. 1 pesticide credit will be offered. Refreshments/snack will be served. Orchard walk, current orchard management updates. $25 meeting fee ($20 for MFGA members.) Contact: Jon Clements, 413-478-7219. Pre-registration is not necessary. 21-May, 2014 Fruit Twilight Meeting at Alyson's Orchard, 57 Alyson's Lane, Walpole, NH (www.alysonsorchard.com). 5:00 to 8:00 PM. In cooperation with U. of New Hampshire Extension. 2 pesticide credits will be offered. Refreshments/snack will be served. Contact: George Hamilton, 603-641-6060. OK, spring is starting to drag out. I am getting to the point where I would like to get it over with and move on! Leading up to bloom is stressful because you look, and you look, and you wonder what is going on? Do the flower buds look OK? I am seeing a lot of "blanks," and after a brief discussion with Duane Greene, we don't expect to have a heavy apple bloom. (As we would if every bud was a "full house.") We are coming off several years of heavy crops, including last year, and we may have finally reached the tipping point. We'll see, this is why I want to get it over with to see what we have to work with! 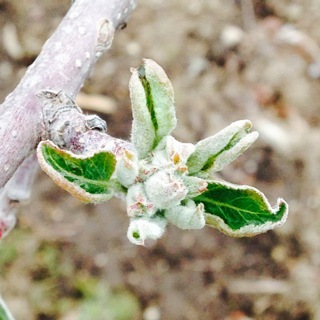 apple flower bud "full house"
If we were to start naming important scab infection periods, this would be Infection Period Awful. The prediction is for 1 to 2 inches of rain starting Tuesday night through Friday, with showers or more substantial rain on the horizon through the next week. 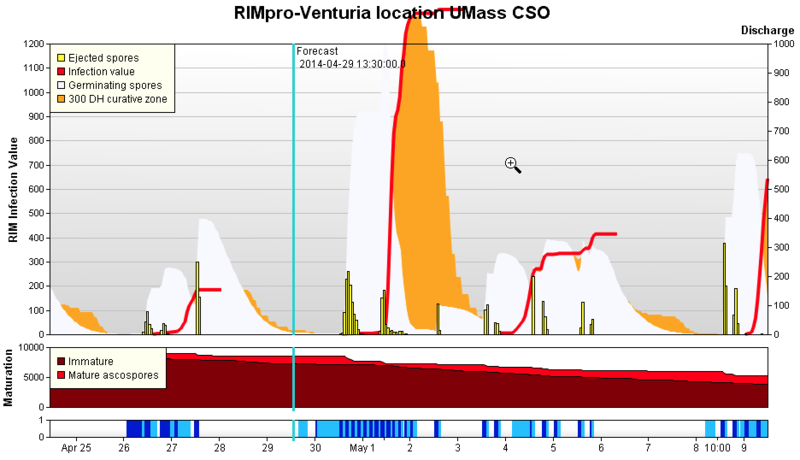 At the same time, RIMpro models a very high potential for scab infection throughout the period. 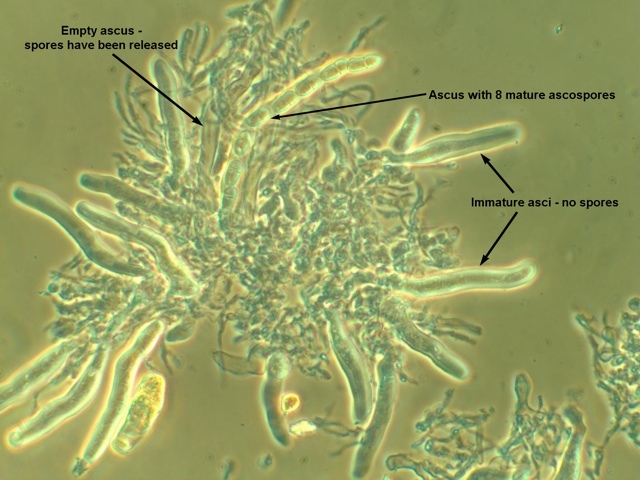 Our direct observations of scab spores show that a large number are ready for release. That all adds up to doing a lot of spraying over the next 7 to 10 days. Get a good start, and put out protectant sprays before the rain starts, if possible. Because the risk is high, adding a systemic fungicide at this point is recommended, because it will be absorbed into plant tissue and much less likely to get washed off by heavy rains. Mix the systemic with a protectant, captan or an EBDC, both to enhance protection and for resistance management. 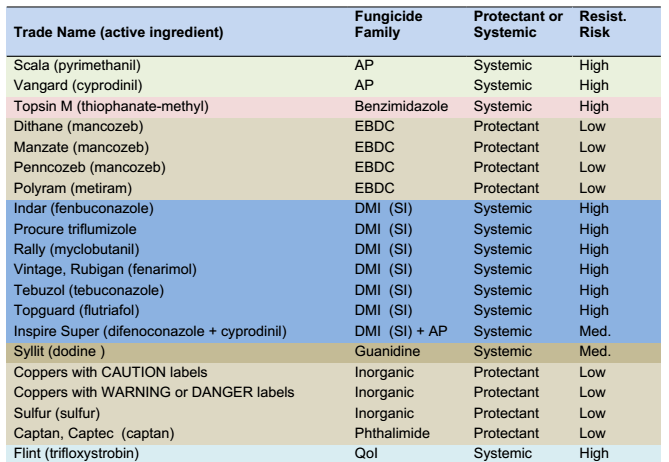 See the list below for systemic and protectant fungicides. This type of application should protect through the next 5 to 7 days. Having said that, if there’s a break in the rain Sat., plan to apply a second mix of protectant plus systemic. At this time, there are more serious infections predicted for next week, so take advantage of breaks to apply fungicides. With weak growing cultivars such as NY1 ('Snapdragon') or Honeycrisp or Jonamac, the lack of sufficient leader growth to reach the top of the trellis (10 ft) by the end of the 3rd year is a serious problem that limits yield in future years. NY1 is a weak tree and does not achieve sufficient leader growth when grown on M.9 or B.9 rootstocks. 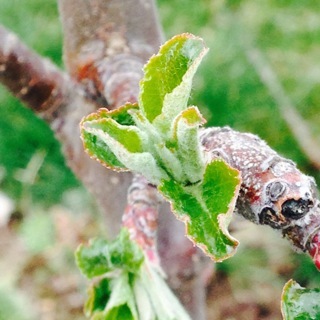 It is very precocious and growth is often weaker than its 'Honeycrisp' parent. NY1's ability to set a heavy crop load in years 2 and 3, coupled with its low vigor, can challenge the best growers to fill the tree spacing in the first 3 years. With more vigorous cultivars such as Gala, Fuji or McIntosh, reaching the top of the trellis by the end of the 3rd or even as early as the end of the 2nd season is usually not a problem. However, with weak growing cultivars, growers need to intensively manage the trees in the first 3 years to achieve the desired growth. 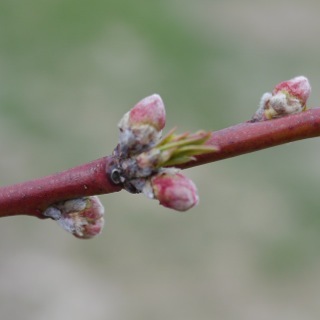 There are several important strategies for maximizing tree growth after planting and during years 2 and 3, including a balanced nutritional program, irrigation, excellent weed control and overall good orchard management. We recommend that NY1 and NY2 ('Rubyfrost') be planted as early as possible in the spring, but not before the soil is dry enough to "flow well". If trees must be stored, keep them at 34°F storage. The storage room should be well aired without any ethylene from stored apples. Keep roots covered and moist; if necessary, water well. Plant them at the first available opportunity when soil conditions warrant. NY1 trees should be planted at close in-row spacing (3 ft or less) using the more vigorous M.9 clones (Pajam 2, Nic 29), or G.41 (comparable to the large M.9 clones, fire blight-resistant) or G.935 (comparable to M.26). 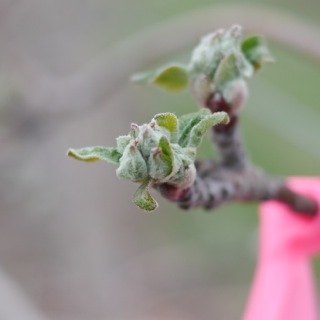 G.41 will be especially useful when orchards are re-planted on old orchard sites since it has some tolerance to replant disease. However, even when G.41 is used, few plantings over the last four years have achieved sufficient leader growth. Thus for the future, slightly more vigorous (but precocious) rootstocks like G.935, G.214, G.202 or G.969 should be used. At the moment, G.935 and G.202 are the only ones on the list that are available for establishing high-density plantings for weak growing cultivars like NY1 and Honeycrisp. Another strategy when planting NY1 trees is to plant the graft union closer to the soil line because of the cultivar's low vigor. This deeper planting depth may be a good strategy, but be careful not to go too far this year. 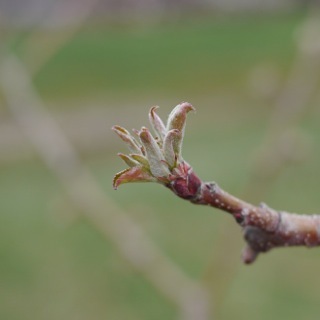 We recommend you leave at least 3–4" of rootstock exposed to prevent scion rooting, which gives variable tree vigor later in the orchard's life, since some trees scion root and others do not. Variable vigor complicates management when the orchard is mature. NY2's graft union should be the standard 6" above the ground level once the soil has settled. After planting, it is critical that you water trees in as soon as possible to ensure good root soil contact. Three gallons of starter solution prepared by using 5 lb/100 gallons of water of a soluble 20-20- 20 fertilizer should be applied the day of planting. After the soil has settled, additional nitrogen fertilizer should be applied. We recommend applying frequent small doses of nitrogen (1/4 lb of calcium nitrate per tree) beginning 2 weeks after planting in a doughnut-shaped band around each tree. The nitrogen can be applied by hand 4–5 times during May, June and early July (spaced every 2 weeks) or through the trickle irrigation (fertigation) with a concentration of 200 ppm (= 0.75 g N per gallon of irrigation water). Water should be applied 2–3 times per week (unless trees get more than 1" of rainfall that week), but with relatively small volumes each time (2–3 gallons per tree). The amount of water to be applied each day (or summed over several days) can be easily calculated using the new Cornell apple irrigation calculator on the NEWA website (http://newa.cornell.edu). Growers should use the calculator at least once per week to determine how much water to apply to the new or mature mature orchard. These applications of water and fertilizer encourage maximum and safe leader growth. By the end of June, leader growth should be 18–24 inches. Growers should keep the leader growing until the end of July through intensive water and nitrogen management, and achieve 24–30" of shoot growth. To do this, growers should (1) quickly install the new trellis and irrigation lines after planting, (2) select the leader when 2" long and remove buds #2-4 when 1" long, (if this is not done, growers should cut competing shoots back with clippers to 2 inch long) to prevent competition with the leader, (3) grow the new trees without weed competition, aphids, corn borers, mildew, and fire blight, (4) water trees frequently (but not when soil is too wet) by trickle irrigation with low volumes per tree, calculated using the new apple irrigation calculator on the NEWA website, (5) remove flowers manually or chemically (see Maxcel recommendation for de-fruiting, below) as soon as possible, even at the tight cluster to pink stage. Even waiting until early fruit set will retard tree growth. Finally, (6) these plantings need frequent applications and small doses of nitrogen beginning 2 weeks after planting. Continued intensive water and nitrogen management will be particularly important for NY1 in the second, third and fourth years, especially if 2014 brings dry, stressful growing conditions (severe and prolonged heat, lack of rains, or severe winds). NY1 blocks that have had relatively poor nutritional and pest management could also be more affected under extreme weather events in 2014. The leader should be attached to the trellis with a rubber band or a wire loop as soon as it reaches each successive wire. With young trees that have a crop, the unsupported terminal portion of the leader above the last wire should be defruited for maximum shoot growth and good lignification during years 2, 3 and 4. Interestingly, the wrapping of the leader around a vertical wire stabilizer works, supports the leader, and encourages new growth above where it is supported by a tie at the trellis wire. 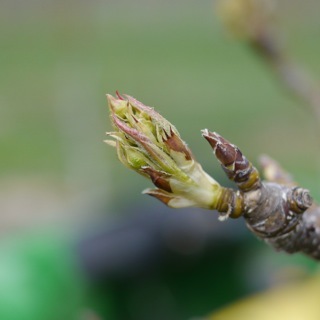 NY1 trees that had moderate or poor growth in the first year or were planted on a weak rootstock should be de-fruited, because fruits will outcompete with overall tree and shoot leader growth for carbohydrates and water. We recommend that you manually remove all blossoms for NY1 in year 2 (and in very few cases in year 3). 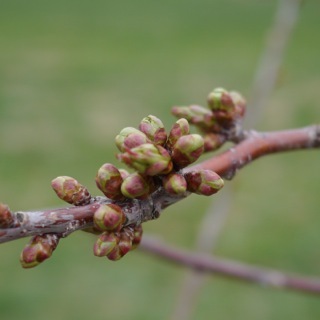 An alternative to hand blossom removal is a high rate of Maxcel (100 ppm = 64 oz/100 gal) plus 2 pt Sevin/100 gal + 1 pt oil/100 gal when fruitlets are about 5–7 mm. Pick a warm day for this spray. The next Healthy Fruit will be published on Tuesday, May 6 or thereabouts, 2014. As always feel free to get in touch with any member of the UMass Fruit Team (http://extension.umass.edu/fruitadvisor/team-members) if you have questions or comments.